It's not secret that I've become quite the Emacs fan over the past couple years. One of my favorite things about Emacs is the Ivy package (and counsel and swiper of course). In exploring what Ivy was capable of I had the idea to write a small package that used Ivy as the interface for my RSS service of choice, Feedwrangler. You can check out the repository here and install the package via melpa. 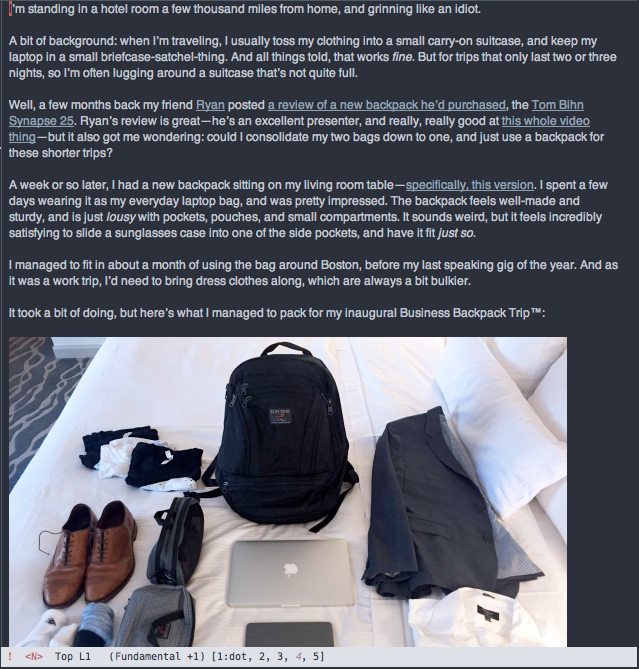 View text posts inside a buffer in Emacs, this supports inline images! Uses authinfo to handle authentication which uses GPG to encrypt credentials. The other big perk to using ivy-feedwrangler is that, unlike elfeed (the package for RSS in Emacs), it interacts directly with the Feedwrangler API! That means I can read things in Emacs and that state is synced correctly to my phone and vice-versa. So, if you have a Feedwrangler account, give ivy-feedwrangler a try and let me know what you think!